Across the mountains of Unohana-yama and the valleys of Kurikara-dani, I entered the city of Kanazawa on July the fifteenth, where I met a merchant from Osaka named Kasho who invited me to stay at his inn. There was in this city a man named Issho whose unusual love of poetry had gained him a lasting reputation among the verse writers of the day. I was told, however, that he had died unexpectedly in the winter of the past year. I attended the memorial service held for him by his brother.
. tsuka mo ugoke waga naku koe wa aki no kaze . 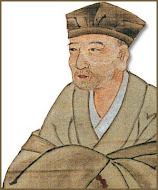 at the death of Kosugi Isshoo 小杉一笑 Kosugi Issho "one laugh"
.- Disciples from Kanazawa　金沢 - .